Police Report: On Friday, the police seized 120 kilograms of gold that has an estimated worth of Rs. 40 crores from a vehicle in the Modinagar Area of Uttar Pradesh. A police officer said that they received information about a car that is carrying more than 100 kilograms of gold. 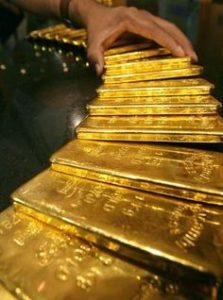 Acting upon the information, they stopped the car and recovered 120 kilograms of gold that has an estimated value of Rs. 40 crores. The police added that the gold was being transported to a factory in Haridwar and came from delhi. The police arrested the driver of the vehicle, 2 security guards, and an employee, all of them were present inside the vehicle. The police added that the 4 people are currently in the custody of the police. The police are currently checking the documents that were being carried with the group of people. The gold was reportedly being brought to Haridwar for a jewelry showroom in Kundan. The Income Tax Department has been informed about the seized gold.